Air > Climate of the Past > What is the climate record of the Holocene and recent past? "It’s quite heroic, this, because most of the people that make a big difference in science must have been considered to be nuts..."
In this clip from a 2006 public lecture, "Will the Living Climate Save Us From Climate Change? ", climate scientist Peter Cox describes the scientific heroism and pioneering measurements of Charles David Keeling. By 1958, Keeling had established an observatory for the continuous monitoring of atmospheric carbon dioxide at Mauna Loa - a remote site on the slopes of a Hawaiian volcano. Carbon dioxide turned out to play a huge role in determining Earth’s climate, and the “Keeling Curve” that Cox presents shows the rise of carbon dioxide concentrations measured at Mauna Loa between 1960 and 2005. To watch the full video of the public lecture, click here. Keeling gathered his data by using gas detectors placed at a remote Mauna Loa site. Since carbon dioxide (CO2) is a trace gas, comprising less than 1 % of the atmosphere, measuring it requires very sensitive instruments. To read how CO2 is measured at Mauna Loa today, click here. 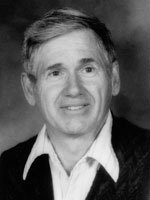 Keeling was a scientist with a reputation for careful scientific measurements. One sign that his instruments were successfully measuring carbon dioxide (CO2) is that concentrations went up and down in a seasonal pattern (the wiggles in the graph). This fits logical expectations that plants in the northern hemisphere would use more CO2 during the spring/summer growing season, and thus atmospheric concentration of CO2 would go down at those times. According to the Dr. Cox, what made it challenging for Charles David Keeling to maintain a continuous observational record of carbon dioxide in Earth’s atmosphere? What does the “Keeling Curve” show? As Dr. Cox says, the Keeling Curve “tells us a massive amount about how the physical world interacts with the biological world.” What is he referring to? Why do modern scientists still refer to Keeling’s work and his curve? What made him and his work remarkable? Based on the data from Keeling’s curve, would you expect CO2 levels today to be higher, lower, or the same as concentrations in 2006, when Dr. Cox presented? The associated graph is an updated version of the one shown by Dr. Cox. 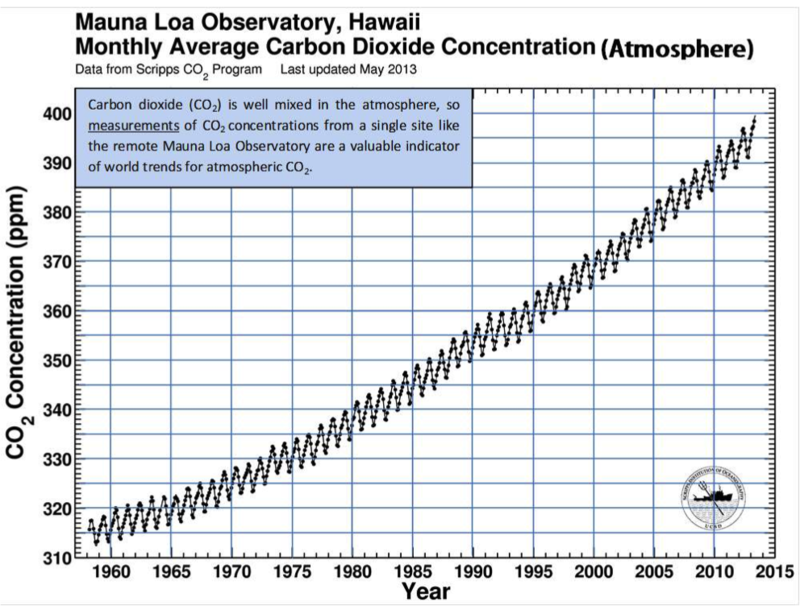 According to the trend in the graph of measurements from Mauna Loa, how did the concentration of carbon dioxide change in the 40 years between 1960 and 2000? a.) stayed the same except for annual variations. b.) increased by about 365 ppm. c.) increased by about 75 ppm. d.) decreased by about 300 ppm. According to Dr. Cox, three of the statements below describe challenges to maintaining a continuous observational record of carbon dioxide in Earth’s atmosphere. Which one does NOT do this? People may have felt that the observations were unimportant. It was difficult to maintain funding. It was relatively unglamorous to monitor the environment. Keeling lost interest in maintaining the observational record. To watch the complete public lecture from Peter Cox, visit the AGCI website. "The History of the Keeling Curve." The Keeling Curve: A Daily Record of the Atmospheric Carbon Dioxide from Scripps Institution of Oceanography at UC San Diego, University of California, San Diego. What is the climate record of the Holocene and recent past? play How has the temperature changed in the last 140 years? play Who was Charles David Keeling, and was he nuts?